"We will take no prisoners. Eliminate on sight!" The episode title appropriateness meter is out again but suspects, due to the presence of the robot Doctor, that we're gonna get conned here! Yeah this episode struggles. It's main problem is that for most of the time it's obvious which is the Doctor and which is the double due to a different actor playing the duplicate in most of the scenes. So when the robot Doctor gives himself away by calling Vicki Susan, the name of the Doctor's now departed granddaughter, it doesn't come as a surprise. ROBOT DOCTOR: Chesterton, now's your chance. Destroy it. Destroy it with a rock! Susan, don't look this way, it'll be nasty. BARBARA: Ian, don't. That's the Doctor! There again it's not unknown for the real Doctor to get someone's name wrong is it? 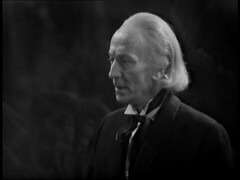 The eventual fight is quite effective and the confrontation beforehand is realised by using Hartnell twice. 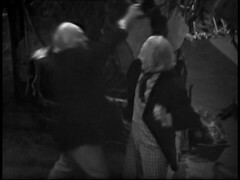 I think lessons are learnt here and the next time there's a duplicate of the Doctor the two are kept apart allowing Hartnell to play both roles. 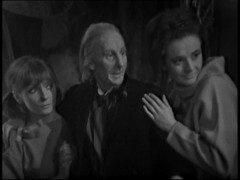 Doubles is a repeated theme in Doctor Who: we meet a real double of the First Doctor in the form of the Abbot of Amboise in The Massacre while the Second Doctor's double is the villainous Salamander in Enemy of the World. we don't meet a double of the Third Doctor but he meets duplicates of all his UNIT friends in the alternate universe of Inferno. The fourth makes up for it by meeting his twice: an Android Duplicate in The Android Invasion (Writer: Terry Nation. Don't waste a good idea Tel) and the shape shifting Meglos in the story of the same name. 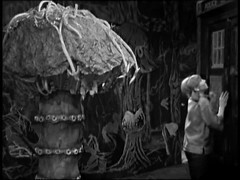 His companions meets doubles a few times too: Harry Sulivan is duplicated by a shape shifting Zygon in Terror of the Zygons and then, like the Doctor , his other Companion Sarah and Sgt Benton is duplicated in the Android Invasion. Romana then models her second body on Princess Astra someone she met in the Armageddon Factor. The Fifth Doctor's companion Tegan meets doubles of herself in the realm of the Mara while Nyssa meets her double Ann Talbot in Black Orchid. Omega models a new body on the Fifth Doctor in Arc of Infinity before the Doctor, Turlough and Tegan are duplicated by The Daleks in Resurrection of the Daleks. 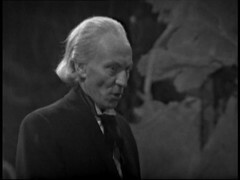 Following the defeat of the robot the Doctor tries to impersonate the Robot Doctor to deceive the Daleks which strikes me as one of the more unselfish things he's done! 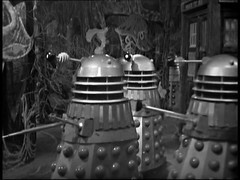 The movie Daleks we spotted last episode can be seen again: there's one in the middle of the group of 3 on the left, and one in the background of the right photo between the middle Dalek in the foreground, our old friend with the broken neck ring, and the Tardis. No sign of the silver eye or the holes for the neck hinge since episode 3 has he been repainted? DALEK 2: Move to position. On my command, advance and attack. 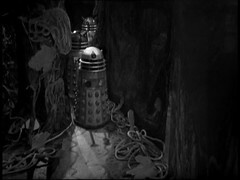 DALEK 5: Align and advance! 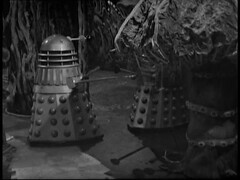 DALEK 6: Advance and attack! DALEKS: Attack and destroy! Destroy and rejoice! Attack and Exterminate! Conquer and Destroy! would have been more appropriate? 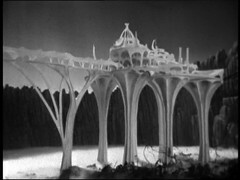 Three very odd credits at the end of the titles this week "WITH" and then three names: Jack Pitt, a Zabri in Web Planet, Mire Beast in episodes 1 & 2 and Cabin Steward in 3, John Scott Martin, also a Zarbi in the web Planet and a Dalek in the first four episodes here and Ken Tyllsen, one of the Sensorites in the story of the same name. I'm assuming that they're the Fungoids we see in the forest and, perhaps, one or more of the Daleks at times. I count four moving on screen at one stage yet only three operators are credited this week: Robert Jewell, Kevin Manser & Gerald Taylor. The WITH comes immediately after the credit for the Mechanoid initially making me think they played Mechanoids here, Pitt & Scott Martin do next episode, but there's only one Mechanoid on screen. 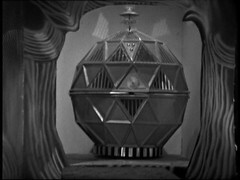 The one we see is occupied by Murphy Grumbar, a Dalek Operator from the first two stories who's not been required here yet. The Voice is provided by David Graham, also doing some of the Daleks here. The design of the Mechanoids, and their city, is fabulous and makes for a really good reveal just as the episode finishes.